Just send me your logo and I will do the rest. My increasing range of merchandise can easily be customised to give it a personal unique touch by simply having your corporate logo printed on the product and message written inside that has meaning for your company. All I need is your company logo and I will do the rest from proofing to delivery. Below are the products I offer this service on where your logo can be printed on the item, any of the images in my collection can be used in these products. For more information on the item please click on the red "more" icon and it will take you to the general sales page where it will give you a closer look at the item that can be customised. Please call or email me for any enquiries, my contact details are on the contact page of the web site. These beautiful brushed metal frames are 30cm wide by 15cm high and come in their own box. Fitted with any image from my collection they can be hung on a wall or easily sat on a desk. The white space at the bottom is reserved for my signature and image title and also perfect for your company logo. With no minimum order quantity. Make your own christmas cards with a personalised message inside and have your logo printed in full glossy colour on the front, back or both. The back is great for a full colour image of the boss / president of the company or your product and a seasons message or greeting. Sky's the limit really and I can work with you on design ideas. Pick a nice selection of my images and have several versions of the card done so you can cover a broad customer base all on one print run. If your looking for something simple and sleek to send to a client then a postcard with your logo and my images on the front and information on the back is a perfect way to get noticed and stand out. My beautiful book that captures the Northern Beaches of Sydney is available to be customised for your needs. Your logo can be printed on the front dust jacket and cover. You can insert custom pages into the book. Conditions apply on this use and minimum order quantities apply. My photo and your frame. Making gift giving easy. 30 posters to choose from at the fantastic price of $19.95 each. $33 per pack and it includes all 16 cards and postage. 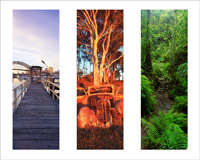 Any of my panoramic images are available in this smart sleek metal frame. Popular corporate gift.